A pair of US Marshals are sent to an island-bound institution for the criminally insane to find an escaped murderer—in Lehane’s lollapalooza of a corkscrew thriller. The Cold War is simmering and a hurricane approaching the Massachusetts coast when Edward Daniels and Charles Aule, his new partner, arrive at Ashecliffe Hospital in 1954, the morning after Rachel Solando, a housewife who drowned her three children, has gone AWOL. How did she get out of the third-floor room she’d been locked into two hours earlier without disturbing the door or windows or any of the three orderlies between her and the outdoors? Other false notes seem even more disturbing. Rachel has left behind a series of tantalizingly cryptic clues as to her fate. Chief of staff Dr. John Cawley, Rachel’s psychiatrist, refuses to share his notes on her, his personnel files, or the treatment files of Dr. Lester Sheehan, her group therapist, who left for his vacation on the ferry that brought Teddy Daniels and Chuck Aule to the island. And the two marshals have brought baggage of their own: Teddy’s hunt for an arsonist he’s convinced is an Ashecliffe inmate and Chuck’s suspicion that the patients are being used as guinea pigs for some villainous new psychotropics. Inevitably, the hunters become the hunted, dissatisfied with reports that Rachel Solando has returned, determined to get to the bottom of the mind-altering experiments being carried out in the dread Lighthouse, separated from each other by natural and human assaults, and sought far more urgently by the ultra-secretive authorities than the woman they came to find. Will Cawley and company succeed in having them declared incompetent and preventing them from escaping? After an extraordinarily humane series of neo-noirs (Mystic River, 2001, etc. 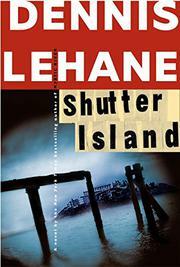 ), Lehane has produced a brilliantly far-fetched page-turner that’s sure to be the most talked-about thriller of the year.